Did you catch Pro Tour Magic 2015 this weekend? It was Standard (inexplicably), and UW came out as top dog. The experience of watching the later rounds with Ivan Floch may have been familiar to those who watched Cifka win the Modern PT a year or two ago with Eggs, in which he had “won” the game but it was going to take ten to thirty minutes to execute the actual kill. Overall the entire thing was clearly defined by Sphinx’s Revelation and Thoughtseize. 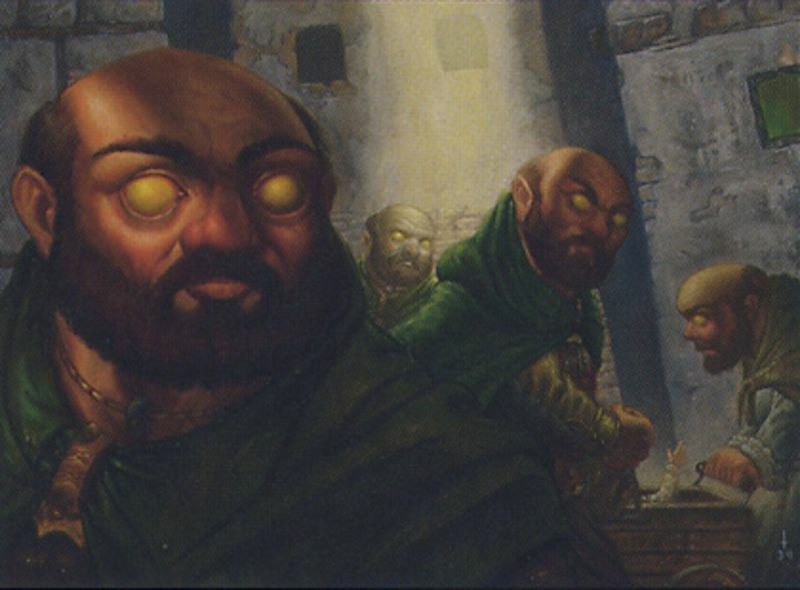 We didn’t learn too much useful information about what Standard will look like post-Ravnica, although it looks like Nissa is pretty legitimate. Ichikawa ran the full set with only nine forests in his deck to great success, so apparently the floor on how many forests you need for her to be good is quite low. Yet the biggest news of the Pro Tour wasn’t the cards or the decks, but rather, Organized Play announcements. Helene Bergeot and the Organized Play (OP) team often use Pro Tours to roll out changes to the OP program, and this weekend’s Pro Tour was no different. The OP program encompasses things likes Grand Prixs, Pro Tours, Pro Tour Qualifiers, etc. This is the team that determines how many slots the PT has, how many pro points should be distributed on average at GPs, what constitutes silver/gold/platinum player levels, etc etc. At PTM15 there were changes made to GPs, PTs, and PTQs, with the PTQ change having the widest, most immediate effect on the most players. Any local store that could run a GPT can now run a PreTQ once per season. If you win a PreTQ, you qualify for a once-per-season regional PTQ. (There are sixteen in the US). If you top four (or top eight if there are >128 players) a regional PTQ, you win an invite to the PT and the airfare to haul you there. The local grinder is going to find themselves in a situation where they’re attending three to maybe nine or ten PreTQs a season, depending how many stores in their area are able to run them and how far the player is willing to travel. Keep in mind there are sixteen weeks each season. Between SCG events, GPs, GPTs, and the new PreTQs, the dedicated player could be competing in competitive REL events nearly every weekend of the year. On a side note, for the first time ever, I’m personally finding that instead of my quantity of play being gated by the frequency of events I can/want to participate in, I’m instead concerned about the entry fees of so many events. PreTQs will likely be $20-$40 depending on whether they’re constructed or Sealed. Between ~$30 PreTQs, $40 GPs, $80 SCG weekends, and the expenses of travelling to all of them, playing Magic is getting brutally expensive. If you’re good enough to be regularly winning prizes at the events you should be able to come out ahead, but that isn’t going to be the case for the majority of players. In conjunction with the frequency at which players will be able to participate in PreTQs, there’s another important component to this. PreTQ seasons are not tied to specific formats. That means that any time a store runs a PreTQ, they have the choice of making it Sealed, Standard, or Modern. Aaron Forsythe has said specifically that if they find the distribution does not line up with what they’d like they will take the reins of PreTQ formats, but for the time being it’s up to store owners to decide which format is best for their store. Regional PTQs will still have their formats locked in by WOTC, but financially this is far less relevant than the free-form PreTQs. Because store owners can choose whichever format they like, there will be Competitive REL events in both Standard and Modern all year round. 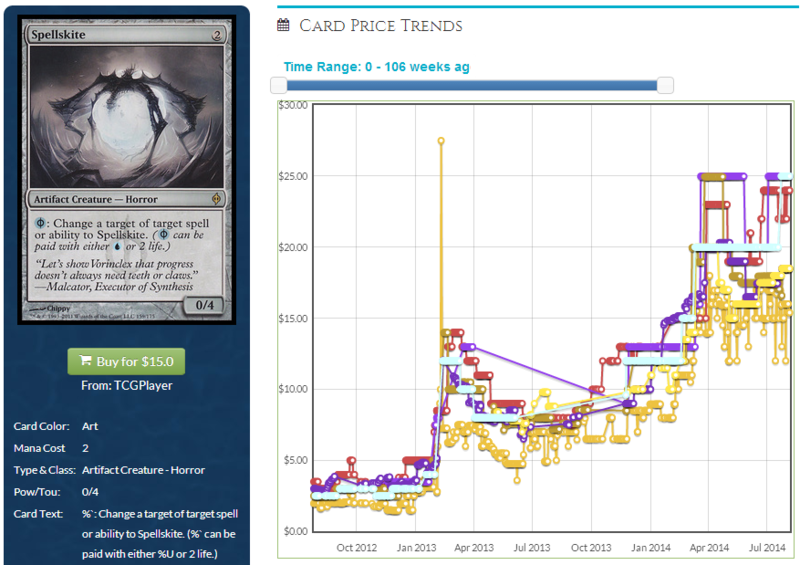 Gone is the Standard/Modern PTQ season and the increased scrutiny/prices they demand from the market. Instead, there is now going to be a much smoother demand for format staples year round. If any random PreTQ can be Modern at any point, grinders are going to need to keep decks together and updated at all times. Instead of trading/selling singles out of season, they’ll be forced to keep them. Format staples like Snapcaster and Tarmogoyf aren’t quite as vulnerable to seasonal changes as role-players, but those role-players should become much more stable. You can see Spellskite’s price bounced around over the last two years as a banner role-player. With constant demand, these rollercoaster prices should be less frequent for well known quantities. You’ll still see wild price rides on flavors of the week that spike and drop drastically, but the cards everyone is already aware of should be much more stable. Standard will see this smoothing as well, although less so since FNM and SCG events ask players to keep cohesive decks together with more regularity. The effect will be most pronounced in Standard after the spring set is released. During the months of May through August (aka now) Standard prices take a real beating for a variety of reasons, one of which is that there’s no real reason for most players to keep up on Standard decks just a few months before rotation. A handful of Standard PreTQs during the summer months will incentivize a lot more players to keep their important rotating staples. It won’t completely shore up drooping interest and rotation fears, but it will help alleviate it. This new world of constant PreTQs doesn’t seem like the best scenario for those of us looking to capitalize on markets in flux. The old PTQ system rewarded the types of people that kept on top of the cycles and the best strategies to profit from them. In other words, me and you. Annual repetition has been one of the best ways to make profit on MTG if you have patience. Pick up rotating cards, grab staples during the off-season, then ship them when demand rises. With PTQ cycles gone it will be tougher to generate value in that way. It will still happen, of course. Standard staples like the Temples are dirt cheap right now but will assuredly climb in the fall. But those types of opportunities going forward will be less obvious, less available, and riskier overall. Another large change in the OP we need to care about is the standardization of Pro Tours. Or should I say the Standardization. Going forward, all Pro Tours will be Standard. I find this upsetting on multiple levels. Nothing but Standard PTs means that one PT to the next there will be far less diversity than we have in years past. The decks that do well at the Dewey Pro Tour will look an awful lot like the decks that do well at PT Khans. Does Thoughtseize crush PT Khans? Don’t expect Dewey to change that much. If all four Pro Tours last year were Standard, you can bet your sweet cheeks that Sphinx’s Revelation would have been in the Top 8 of all four. If you hate tier one Standard cards now, you are going to loathe them in short order. Another facet to all of this is that we won’t be seeing superteams trying to break Modern once or twice a year. Putting twenty guys in a house for two weeks with a singular goal of finding the best deck in Modern is good for the format in moderation. They set the format, identify the pillars, and show the rest of us what to do. Then the general public tweaks the big decks over the following months, trying out new cards in their established decks until the next Modern PT when the pros reassess what the last few sets added. Even if it hasn’t felt like it lately, Modern PTs definitely have an impact on the format. There are eight cards on the Modern ban list that weren’t there at the formats inception, and all eight bans can be traced back to their respective performances in a PT. PTQs aren’t getting cards banned and changing the format. Without a Modern PT, the format is going to be considerably more stale, which will lead to less interest and less breakout cards. The most financially troubling part of all this is that we lose the Block Pro Tour. The Block PT has always been an odd duck, as it’s the only high level event that normal players never encounter. As removed as it is from the general player, watching it is a lot of fun and the information it provides is invaluable. Seeing what succeeds at the Block PT is a huge indicator of what the format will look like post-rotation. Without Block, we’re going to have trouble identifying which cards are the true key players in the upcoming Standard. To see why this matters all we need to do is look back a few days. There were only a handful of unique M15 cards that showed up in the Top 8, and the painland cycle makes up roughly half of them. What M15 cards will matter beyond the lands and Nissa? PT M15 certainly didn’t tell us. If PT Journey had been Standard, we’d have no idea what this coming Fall would look like. PT Journey put Courser of Kruphix, Sylvan Caryatid, Kiora, and more on the map, giving us insight into what would be good once Khans hits. Obviously nobody expects those Block decks to translate, but it allowed Theros stars to shine without being drowned by Sphinx’s Revelation. Without any of this information it’s going to be much more difficult to identify the fall pillars through the noise of the old set. Next year we are going to be a lot less sure about which Khans cards are going to be big role players once Theros rotates than we are sure about the Theros staples that will be good as Ravnica rotates. The silver lining here is that if you’re very good at predicting power levels you’ll be able to identify the Coursers when they’re only $2 and make an absolute killing when they inevitably hit $15+. Of course this is exceptionally difficult, and even the best don’t manage to identify the pillars consistently. Those that can read the format well will make even more money than they have been with fall rotations, but it will be much tougher for the average player to wring value from Block results. The new PTQ system smoothes demand curves, removes annual price cycles, and obliterates many small vendors, leaving them with no good way to buy and no good way to vend. The PT change means we have less overall interest in Modern, less top Magic pros working on finding awesome Modern decks, and less information about fall metagames. Overall I’d say PT M15 was pretty bad for those of us interested in making money on cardboard. I will miss block pro tours, but perhaps there will be more room for a person to discover whats good on their own. PTQ changes were not announced at the PT, they were published in a mothership article on 7/29. Kiora is in my spec, especially she could fit two new clans in KTK. That means she has potential to fit to at least two decks in the coming meta. Start out small, and increase the duration and intensity of the exposures.